If you have a deck, whether it’s up high or down low, you’ve probably considered some type of screening. 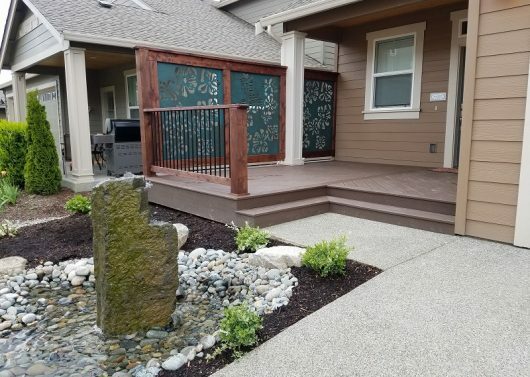 Adding a screen to your deck can help provide privacy to/from neighbors, help block the elements such as wind, rain, and sun, or help screen from a particular feature of your landscape. 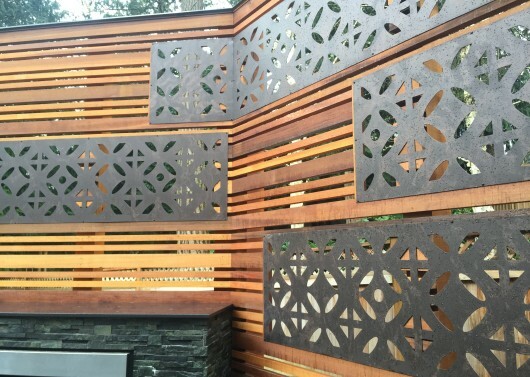 Horizontal Wood Screens- Horizontal wood screens are one of the more common ways to add screening to a deck. 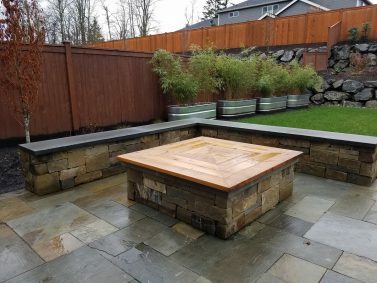 They can be made out of the same wood as your deck making a seamless transition from deck to screen or you can use a different type of wood or a different colored stain to add a contrasting element to your landscape. Depending on the type of wood you use will determine how expensive it will be. 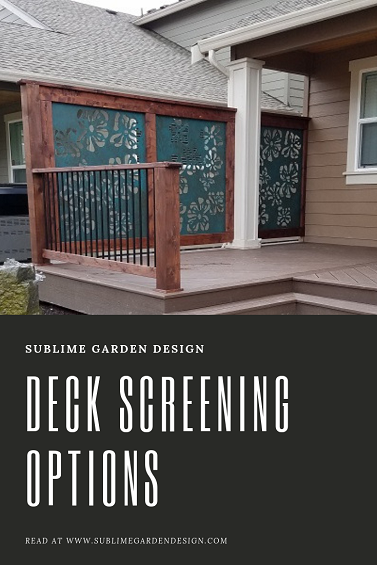 These screens work well if you have a hot tub on your deck where you really don’t want other’s peering in or for other applications such as garbage can screening. 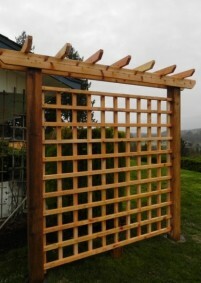 Lattice/Trellis- Lattice work is another common option for screening your deck with wood. Both offer a more open type of screening so these might not be an option if you’re wanting a screen for a more private or secluded feel. If you’re wanting to add a bit of green to your space, both of these work well for trailing vines as well. If you have lower deck, the screen can be placed in the ground and vines can be planted at the base or if you have a deck higher off the ground, you can have built in planters with lattice work built into the planter for the vines to grow on. 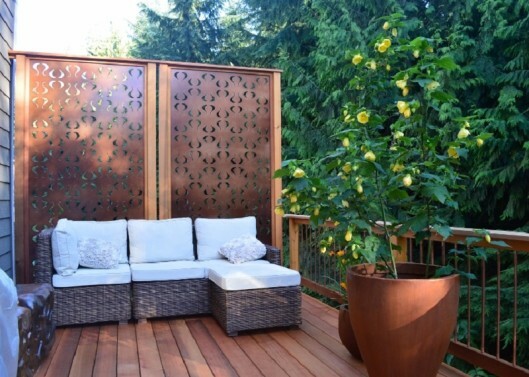 Either way lattice work can be a versatile screen for your deck. As with any kind of wood screening, there will be some maintenance involved. Staining and sealing will help protect the wood and should be reapplied annually. 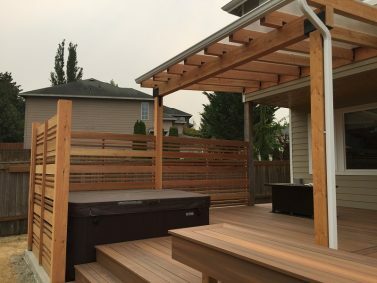 Parasoleil Screens- One of our favorites, Parasoleil screens work perfectly for deck screening but they can be a bit pricier. Not only can they provide screening for your deck, but they have other applications in the landscape such as shading, railing, and cladding. They’re typically made out of aluminum, but they also have options for copper and steel and come in 3 different thicknesses. You can choose from 50 patterns and 16 powder coat finishes to fit in with the style of your outdoor space. The panels are easy to maintain and can be attached to wood or metal. They do have a lead time of about 7 weeks, so you’ll need to wait a bit longer, but the wait is worth it. 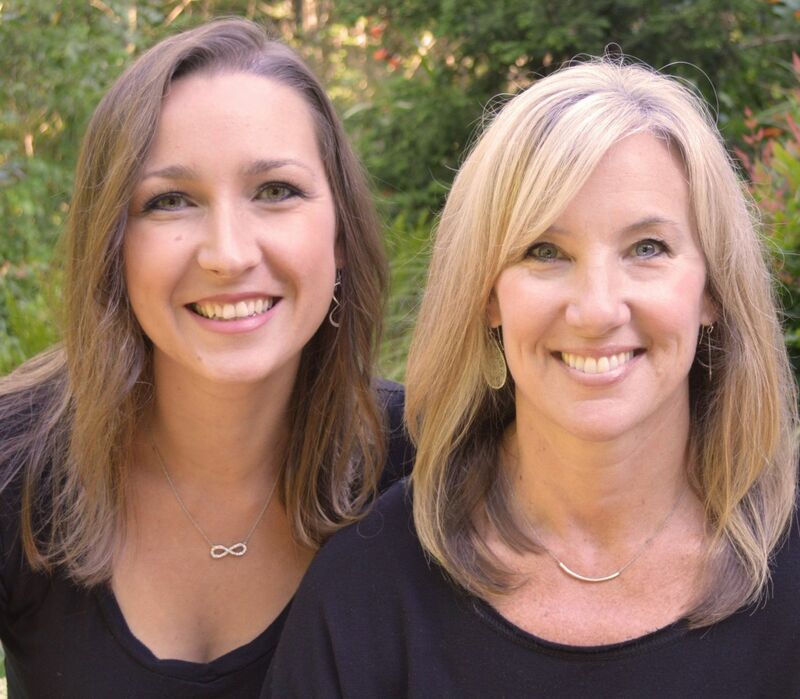 To see other Parasoleil screening options, check out our Portfolio. Retractable Screens- These screens are usually made of fabric and are especially useful when you don’t always need the privacy. You can get them in a wide variety of colors and can be used in overhead screening or vertical screening situations. 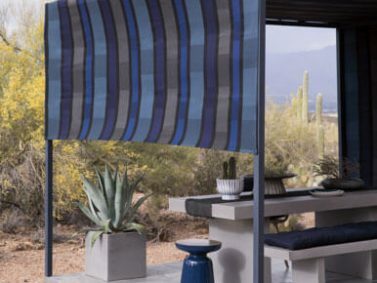 The biggest thing to remember about these fabric retractable screens is that they are very prone to mold/mildew, especially in our rainy pacific northwest climate. Make sure to choose mold/mildew resistant fabrics to help with this if you want to go with this option. If it’s possible, it’s also a good idea to take the fabric down during the rainiest months to help keep your screen in as good of condition as possible. 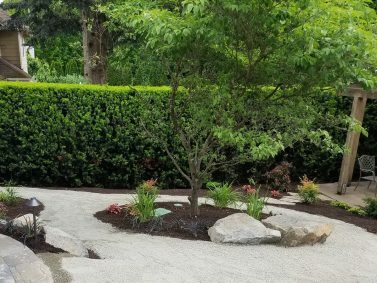 Sky Pencil Japanese Holly (Ilex crenata ‘Sky Pencil’)- If you have a shorter amount of deck that you need screened, the narrow, columnar form of the Sky Pencil Japanese Holly may be a good option for you. Needle-like, soft foliage is dark green year around. It does best in full sun and can reach 6-8 feet tall and 2-3 feet wide. Once established it can tolerate a mild drought. These can be placed in containers as well if you need them to be portable or placed on a taller deck. Bamboo (Phyllostachys)- As everyone knows, Bamboo grows quickly and vigorously. Because of this, we only recommend using Bamboo if you’re going to plant it in containers where it can’t spread. Stone Bamboo (Phyllostachys angusta) has cream colored new shoots and dense medium green foliage. You can also find Black Bamboo (Phyllostachys nigra) with green new shoots that mature to jet back. The feathery green leaves compliment the culms nicely. If you’re wanting a quick option for screening your deck with plants, Bamboo is a great option. Hicks Yew (Taxus x media ‘Hicksii’)- Another evergreen option, the Hicks Yew is a narrow, upright growing shrub with dark green foliage. Hicks Yew is also known for its bright red berry like cones. It can reach up to 10-12 feet high making it ideal for privacy screening. Plant in partial to full sun in well-drained soil away from harsh winds. 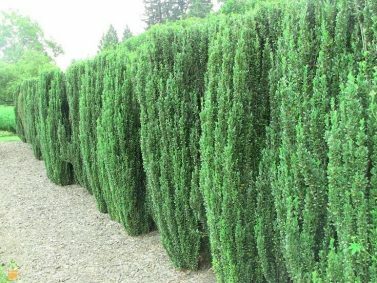 You can read more about other types of hedges for privacy here. 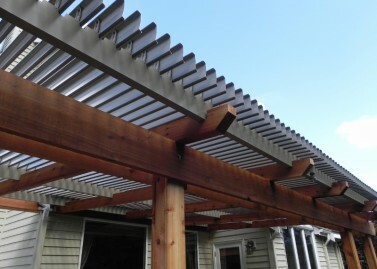 We’ve talked about ways to add screening on the sides of your deck, but what about from above? If you have neighbors with windows up higher or you’re the low spot between 2 houses or if you just want a little extra protection from the elements, having some screening above your deck is something to consider. Parasoleil- As mentioned above, Parasoleil panels can be used for shading. Because of the holes cut in the patterns, this wouldn’t be the ideal option if you’re wanting to be completely protected from rain, but they will provide a moderate amount or protection. 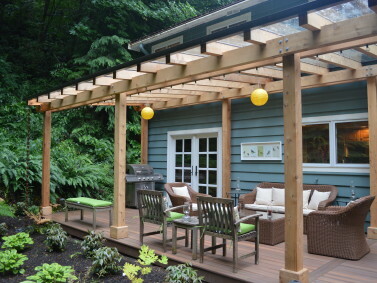 Pergolas- Pergolas can be made from wood or metal and provide a moderate amount of shade. Unless you have a cover on it, they won’t provide rain or snow protection. They’re perfect if you don’t plan on spending much time out on your deck in the rain. They can be attached to your house or left as a freestanding structure and can be built to fit whatever size of deck you have. If you decide to use wood, it’s best to stain and seal annually to protect the wood. Wood can provide a warmer feel to the space while metal might add a more modern or industrial feel, so you have plenty of options depending on what look you’re going for. 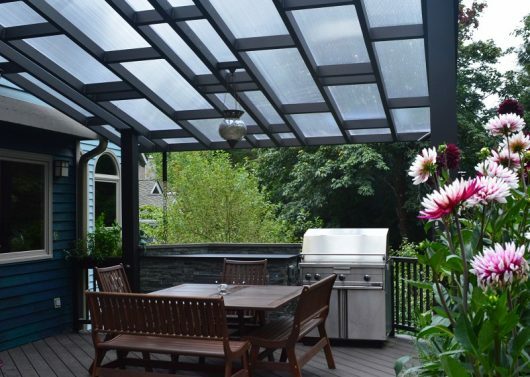 Polycarbonate- When combined with a wood or metal pergola, a polycarbonate roof can be a great addition to a deck or patio. The clear polycarbonate let’s the sun shine through while still providing a covered spot away from rain and snow but you can also find polycarbonate in other, more opaque colors such as gray or white. Polycarbonate roofing is pretty low maintenance only requiring it be hosed off when necessary. You can use a mild cleaner and a soft brush if needed, but harsh cleaners and abrasives should be avoided as they can scratch the polycarbonate. 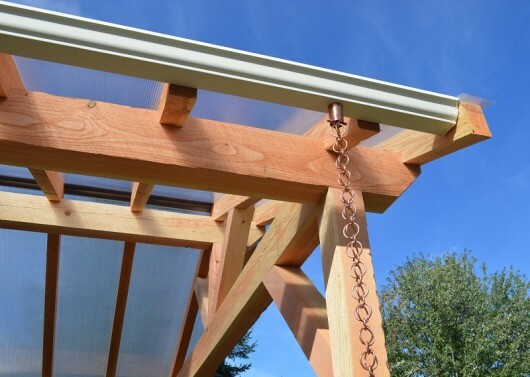 Solara- If you’re wanting to take your pergola a step further, you can get an adjustable patio cover from Solara. 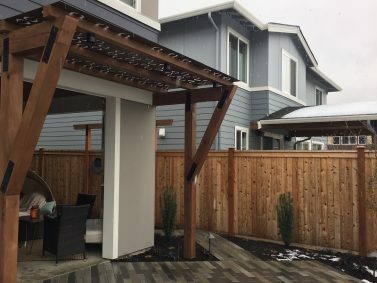 Their patio cover system allows you to control the amount of sun or shade and can even create a rooftop to protect you and your furniture from rain or snow with their louver system. They are made from aluminum, so they withstand all weather elements and they come in 5 different colors. Maintenance is similar to polycarbonate in that you only really need to rinse with a water hose. What kind of screening do you have on your deck? Or if you don’t have any screening, what would your top pick be for screening a deck? Let us know in the comments, we’d love to hear from you! Organized under Design Style, Landscape Design, Outdoor Gathering Space, Screening, Trends. Labeled as aluminum pergola, deck privacy, deck screening options, deck screening plants, deck screens, horizontal wood screen, lattice deck screen, metal pergola, options for screening a deck, parasoleil screens, pergolas, plants for screening deck, polycarbonate, polycarbonate pergola, privacy screens for deck, solara, solara covered pergola, wood deck screens, wood pergola.